On Sunday the New York Yankees will retire Derek Jeter’s uniform number 2. After a call-up in 1995, Jeter the following year became the Yanks’ starting shortstop and held that spot until his retirement in 2014. Jeter went o-for-5 in his MLB debut, May 29, 1995, in Seattle versus the Mariners. Jeter played shortstop in 2,675 games for the Yankees, most of any player in club history. Only three other players have played over 1,000 games at short for the Bronx Bombers: Phil Rizzuto (1,647), Franke Crosetti (1,515) and Roger Peckinpaugh (1,214). Of his 260 career home runs, 189 of them came in games his team won. Seventy-one were hit in losses. 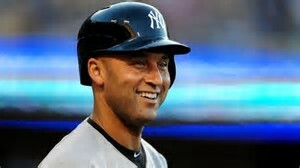 Jeter’s career average in games the Yankees’ won was .338; in games lost by the Yankees, his average was .265. Seventeen players wore the #2 for the Yankees. The last player to wear #2 before Jeter was Mike Gallego (1992-94). Since 1969, the players who wore #2 for the Yankees were Wayne Tolleson (1986-90), Dale Berra (1985-86), Tim Foli (1984), Bobby Murcer (1979-83), Darryl Jones (1979), Paul Blair (1977-79), Sandy Alomar (1975-76), Matty Alou (1973) and Jerry Kenney (1969-72). Jeter had 1,311 career RBIs, but he only had 100 RBIs in a season once. That happened in 1999 when he had 102. Derek was the 1996 A.L. Rookie of the Year. Runner-up that year for the award was James Baldwin, a pitcher with the White Sox. Baldwin won 79 games in his 11-year career. The N.L. Rookie of the Year that season was L.A. Dodgers outfielder Todd Hollandsworth; he batted .273 and had 98 HRs in a 12-year big league career. Jeter hit 26 home runs versus the Red Sox, most against any opponent in his career. His best career batting average came against the Pirates (.422) and the Rockies (.412). His worst career batting average was against the Astros… he hit only .224. Five different Yankees played shortstop in the five seasons before Jeter was handed the job in 1996. The previous five: Tony Fernandez (1995), Mike Gallego (1994), Spike Owen (1993), Andy Stankiewicz (1992) and Alvaro Espinoza (1991). Derek hit 255 home runs as a shortstop for the Yankees, the most by far in the team’s history. Frankie Crossetti had the second most with 89, followed by Tony Kubek with 49. During Jeter’s long run as Yankees shortstop (1996-2014), Eduardo Nunez filled in the most games at shortstop with 152. The other players who played shortstop for the Yankees in 50 or more games during 1996-2014: Enrique Wilson (83), Jayson Nix (66) and Ramiro Pena (62). Bonus stat: Fifty-one different Yankees played second base during Jeter’s 1996-2014 run as the Yankees shortstop. Leading the way was Robinson Cano with 1,351 games, followed by Alfonso Soriano, 467 games, and Chuck Knoblauch, 381 games.